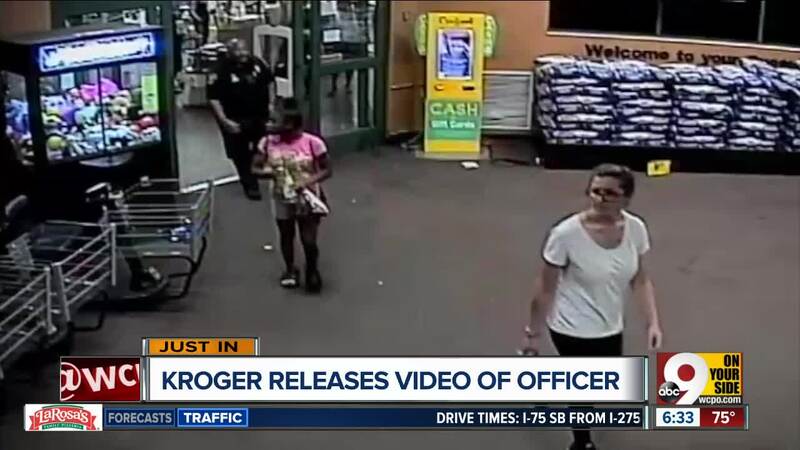 CINCINNATI -- An internal use of force review found that the police Ohio officer who stunned an 11-year-old girl accused of shoplifting violated several Cincinnati Police Department rules in the incident. for expressing prejudice by making a comment about the lack of grocery stores in predominantly black communities. "This is why there aren't any grocery stores in the black community, because of all this going on," Brown told Donesha. Both are African-American. Police released the review and body camera video from the incident Tuesday. Brown's body cam video starts as Donesha gets back up. The video shows Brown holding onto the girl with her arms behind her back. He leads her back inside the store and takes her to an office, where he asks her about the other girls who were with her and what items she took. "You don't have any receipts for any of this stuff. So guess what: you get to claim all of this," Brown says on the video. "Sweetheart, the last thing I want to do is tase you like that. You know you're caught. When I say, 'Stop,' just stop. That hurt my heart to do that to you. Then I got to listen to all these idiots in the parking lot telling me how I was wrong for tasing you. You broke the law and you fled, and I was trying to apprehend you." The video then shows 4-foot-11, 90-pound Donesha crying as firefighters remove the Taser barbs from her back. Brown tries to comfort her and tells her to stay calm. Donesha took items like candy, beef jerky and infant clothing worth a total of $53.81, according to the use of force review. A Kroger employee alerted Brown to three girls who were attempting to shoplift items. she first tried to leave through one set of doors that were locked because the store makes customers use one set of doors after 9 p.m.
Donesha and the other girls loitered near the customer service desk for about five minutes, according to the review. She then walked past the self-checkouts and out the unlocked door. Brown asked her to stop and show her receipt. Donesha ignored him. He repeated the request twice, and she continued to ignore him and walk away. He did not warn her about the use of a Taser if she refused to stop running, though department policy requires it under most circumstances. 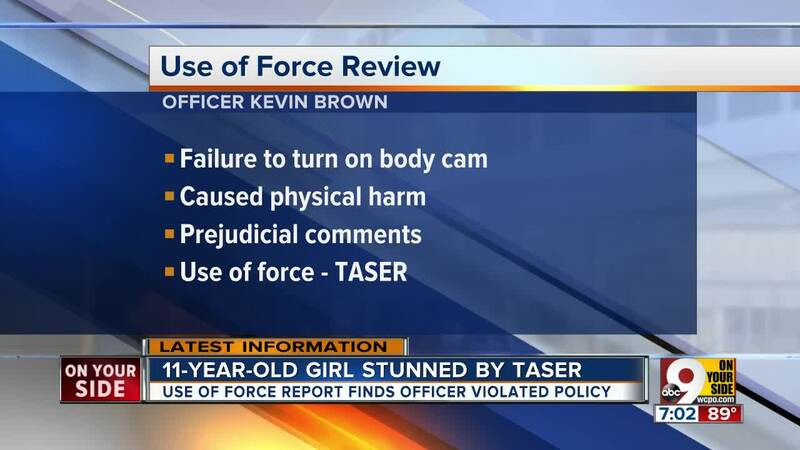 In the parking lot, Brown used his Taser from about 10 feet away, according to the review. One barb struck Donesha in the center of the back and the other struck her slightly below the waist. The Taser stopped Donesha and cycled for five seconds. She suffered a small abrasion to her right arm when she fell. In an interview for the use of force review, Brown acknowledged that Donesha did not appear to be a threat to himself or others. He told an investigator that his statement about grocery stores in black communities is supported by statistics and was not biased. Brown now will face a pre-disciplinary hearing, according to Police Chief Eliot Isaac. Lt. Steve Saunders said the hearing "would be to review sustained findings" associated with the review. Donesha was initially charged with theft and obstruction, but the charges were later dropped. "I do ... believe that our policy is current," Isaac said. "But whenever an incident like this happens, we must take the opportunity to make sure we are staying current with what’s happening nationally. 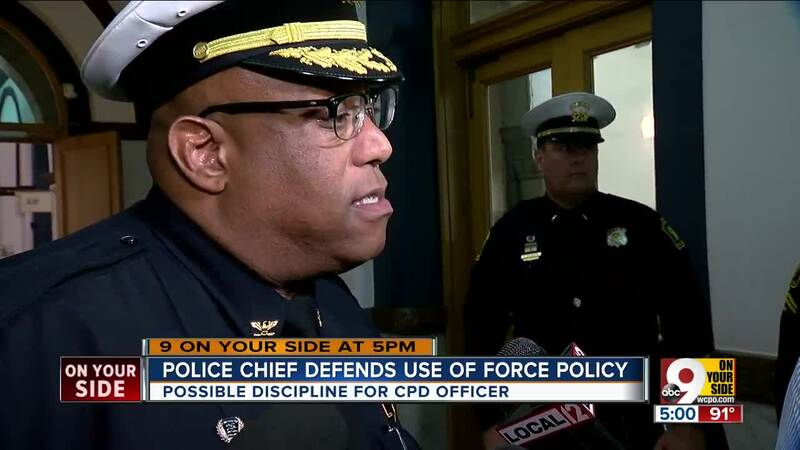 There may be some areas in which we can tweak, but I believe we do have a very solid policy around our use of force." Records provided by the Cincinnati Police Department show Brown had only one recent use of force investigation. He was found to be in line with department policy after that incident last year. The Citizens Complaint Authority's annual report shows six Taser-related allegations, but only one complaint from 2017. A stun gun can be used on anyone between the ages of 7 to 70, according to Cincinnati Police Department procedure. The police department’s Planning and Inspections Section is reviewing the use of force policy, Isaac said. "A lot of places have moved to — instead of specifying age specifically — that they talk about small children, considering the stature and size of the individual that you are using force against," Isaac said. "And I think that's something that I think we're going to take a very close look at." Vice Mayor Christopher Smitherman suggested a public vote regarding any changes made to the policy.